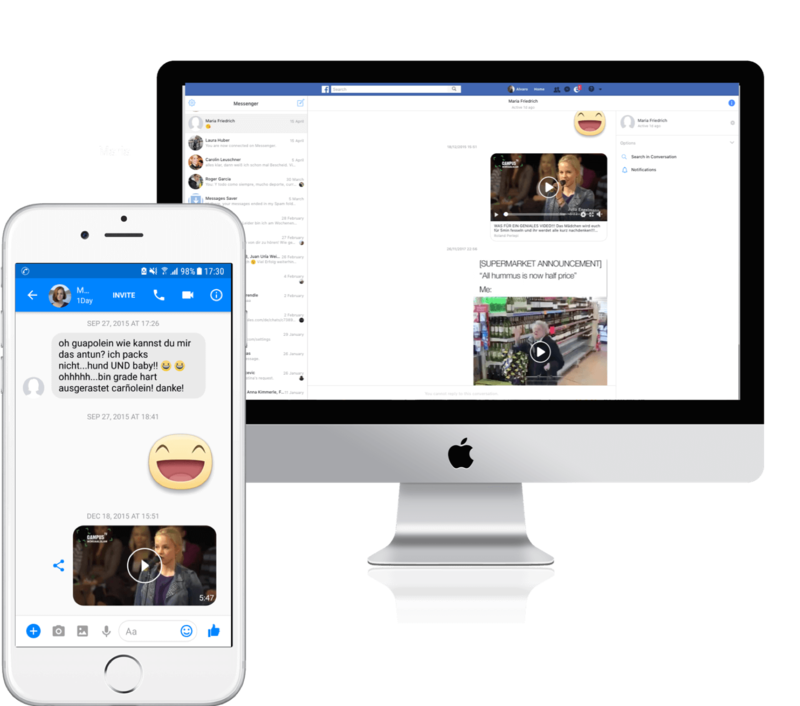 There are many reasons why you might want to download your Facebook Messenger Chat history: You may want to save a certain Messenger conversation or you just want to have a backup outside of Facebook. Maybe also you are one of the #deletefacebook people and are looking for a way to backup your data. 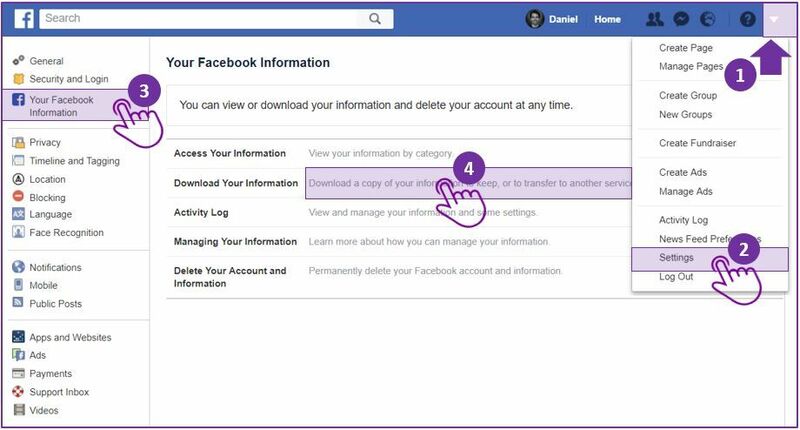 The good news is: Facebook now offers the option to download specific data only, as well as everything they have ever saved about you. That means you can select which type of information you want to download (messages, posts, pictures…) and which time frame this download should cover. Follow these steps to request a copy of your Facebook Messenger chats directly from Facebook. You can do this either in the mobile App as in the desktop version of Facebook. Open your Facebook account and click on the small triangle in the top right corner of your screen (1) to access your „Settings“ (2). Next, click on „Your Facebook Information“ (3) and then on „Download a copy of your information…“ (4). 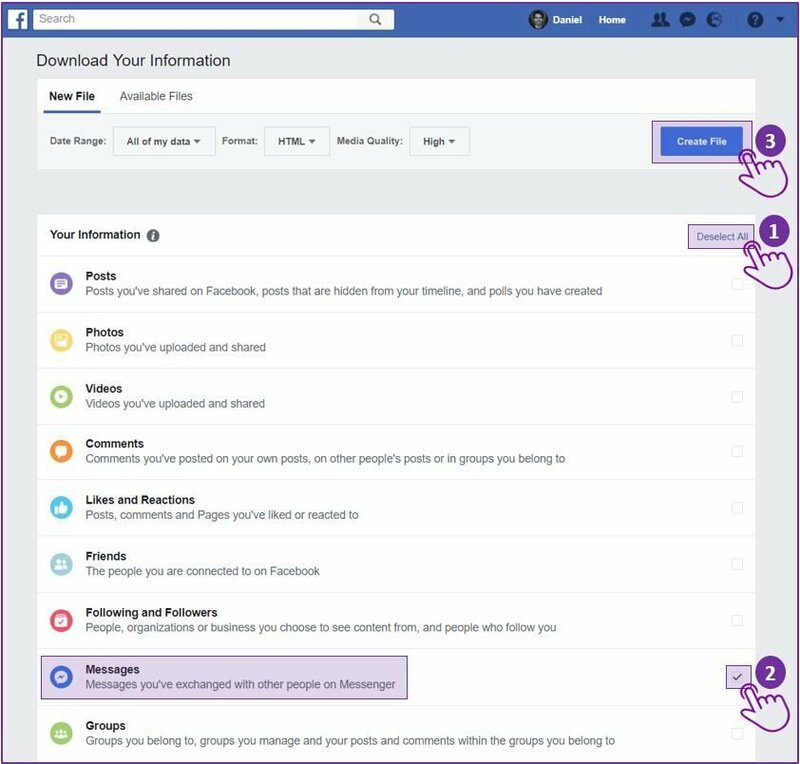 On this page you can select the data you want to download from Facebook. First, click „Deselect All“ (1). Then, tick the box in the „Messages“ section (2) to download your chats only. Finally, just click on „Create File“ (3) in the top right corner. Facebook will then prepare the download of your messages. This process can take up to 15 minutes, depending on the number and size of your chats. Once your chats are ready for download, Facebook sends you a „Notification“ (1). Click it to access the downloads summary. Click on „Download“ (2) to save a copy of your Facebook chats on your computer. Scroll all the way down to „Your Facebook Information“. Here, click on „Download Your Information“. First, click „Deselect All“ (1). Then, tick the box in the „Messages“ section (2) to download your chats only. Now, scroll all the way down and click on „Create File“. Click on „Download“ (2) to download a copy of your Facebook chats. Did you know? 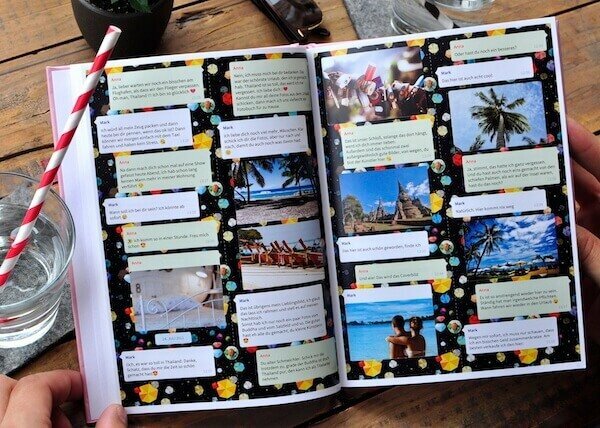 Now you can also transform your Facebook Messenger Chat into a book! Yes! zapptales makes it really easy to turn your Facebook Messenger Chat into a book: just upload the downloaded files and it will be automatically transformed into a beautiful book.